Saturday, November 22: Deborah dropped me at the airport at 8:30 pm for a 10:25 pm flight to Rome, from where our group would fly on to Sardinia. Skipped dinner onboard and went to sleep – very comfortable on Alitalia Business Class with seats that fold down supine. Sunday, November 23: Our delegation (three Quebec wine writers, two from BC, one from Ottawa and two of us from Ontario) arrived in Alghero at 4:30 pm. Two of the party lost their luggage between Rome and Sardinia, which put us an hour behind schedule. A two-hour bus trip to Tempio Pausania in the north of the island for a visit to Cantina di Gallura. Sardinia has 1897 kilometres of coast and covers 24,000 square kilometres in total. There are 3,900 hectares of Vermentino planted on the island (5,200 ha. total in Italy, in Tuscany and Piemonte and Liguria where the grape is called Pigat). Then on to a local restaurant – Hotel-Ristorante-Pizzeria Il Melograna da Claudio – for a huge dinner. We started with a magnum of Gallura Brut 2011 (Vermentino), a Charmat sparkler. 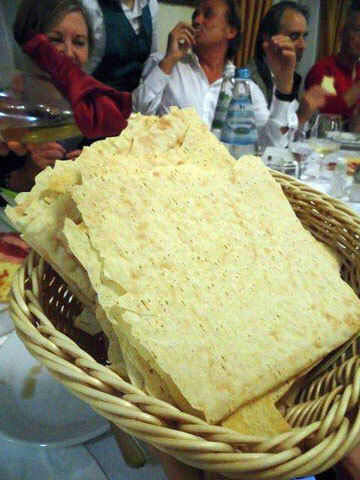 Al the dishes included the local flat bread called carasau, very thin and crisp. A variation is made with olive oil and rosemary called guttiau. We started with wild boar prosciutto on carasau, followed by orata (sea bream) marinated in almond milk with myrtle berries and red peppercorns. Then the dishes kept arriving: oysters, swordfish carpaccio, tuna tartar with black mushrooms, shrimps, bottarga salad, razor clams, fregole pasta with clams and artichokes and powdered fish roe and a plate of octopus. Then a whole dorade baked in salt and delivered flaming to the table. 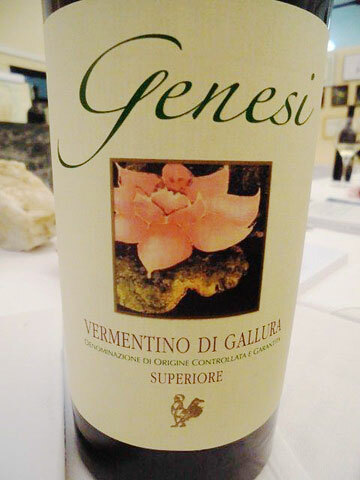 The accompanying wines: Cantina Gallura Vermentino Canayli 2013, Genesi Vermentino 2013 in magnum, Balanjana Bianco Colli del Limbara Vermentino 2010 (wood aged). With a dessert of baked goods, Cantina Gallura Modcati di Tempio Spumante. Finally, a digestif, Mirto di Sardegna Tremontis and grappa. After dinner, we transferred to the Hotel For You (yes, that was its name) in the town of Olbia and checked in at midnight. Monday, November 24: Woke at 4 am this morning. So started working. Left the hotel at 9 am for a tour of Cantina delle Vigne di Piero Mancini in Olbia. Piero Mancini started out as a dentist. Two hours later, a tour of Cantina Pedres in Olbia, owned by Giovanni Mancini. His wife Caterina and daughter Emanuela introduced his wines while he busied himself bringing in a buffet lunch. After lunch we departed for the town of Arzachena to visit Società Agricola Surrau. On the way we diverted to visit Porto Cervo on the Costa Smeralda. 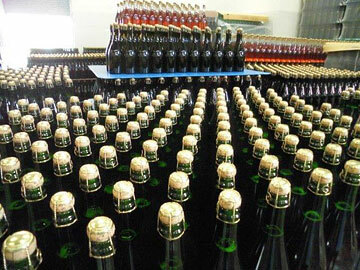 It was created by Prince Karim Aga Khan and various other investors. 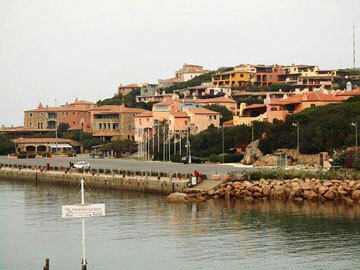 Porto Cervo has a resident population of 421 very wealthy inhabitants. 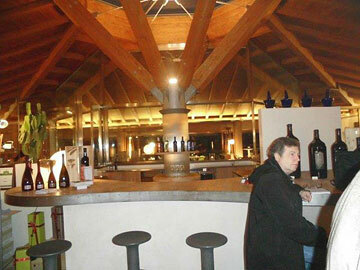 The three brothers of the Demuro family, who own the Surrau winery, are big in construction and tourist resorts. 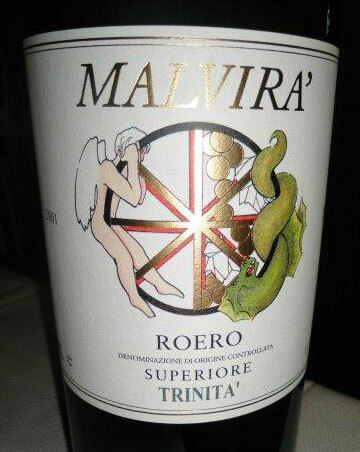 They returned to their grandfather’s farm to create a stunning modern winery, which they named Surrau after the valley. 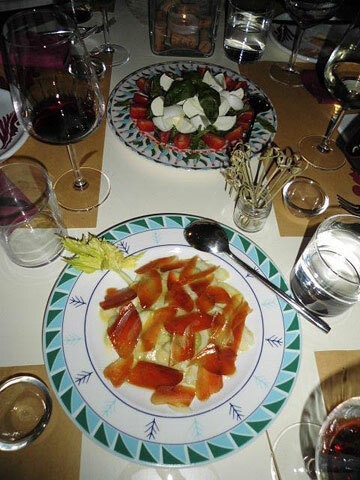 Dinner: a series of plates of bottarga and celery salad, mozzarella and tomatoes, cheeses with honey, bresaiolo with arugula, salamis, ravioli stuffed with ricotta and lemon rind. Dessert: ricotta and honey with Surrau Sole di Surrau Vermentino Isola di Nuraghi Passito 2013 (medium sweet, fragrant, honey flavour but a little short on the finish (88)) and SurrauPassito Raju 2013 (dense ruby; pruny plum nose; medium sweet with a raisiny and spicy flavour (88)). Finally, Surrau Grappa Affinata. Then the long drive back to Hotel For You in Olbia. Tuesday, November 25: After breakfast we left with our luggage for Alghero to see Cantine Sella & Mosca – where we spent much of the day. The company was founded in 1899. In 1905 there were 1,671 grape varieties planted on the property. 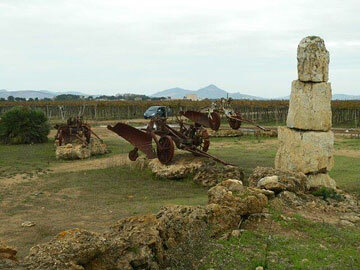 They are the only winery in Sardinia now growing Turbato. The soil is amazingly rocky here. In fact, it was a Stone Age necropolis (38 graves were found in the rocks). 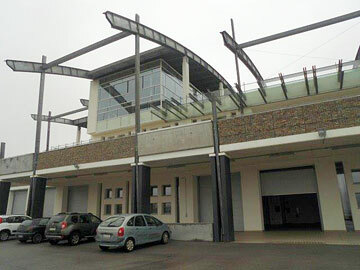 520 hectares of vines planted in pergola fashion and on trellises. To dry the bunches for their passito they have 4 kilometres of grapes left outdoors on bamboo canes for 2–3 weeks. In 2002 Campari bought the company. At the tasting before lunch I lost my notes because of a wrong keystroke on the computer; but I do recall the standout wine: Sella & Mosca Marchesi di Villamarina 2009. It would not have been out of place in a blind tasting of Second Growth red Bordeaux (93). Before lunch we had an aperitif of Sella & Mosca Torbato Terre Blanche Cuvee 161 Vino Spumante Brut (fresh and easy drinking with a dry pear flavour and lively acidity (88)). The menu: spinach and “Rebetta apple” salad; Sardinian pasta filled with potato, cheese, fresh mint, in basil-flavoured tomato sauce; baked sea bream with potatoes and baked seasonal vegetables; selection of Sardinian sheep’s milk cheeses. Dessert: fresh fruit and pine nut tart. The wines: Sella & Mosca La Cala Vermentino di Sardegna 2013 (light straw colour; minerally, floral, peach bouquet; medium-bodied, fresh, white peach and citrus flavours; sweetish mid-palate flavour with a bitter almond finish (87)); Sella & Mosca Terre Bianche Torbato Alghero 2013 (straw colour; minerally, white flowers on the nose; dry and brad on the palate with some sweetness and a bitter finish (87)). 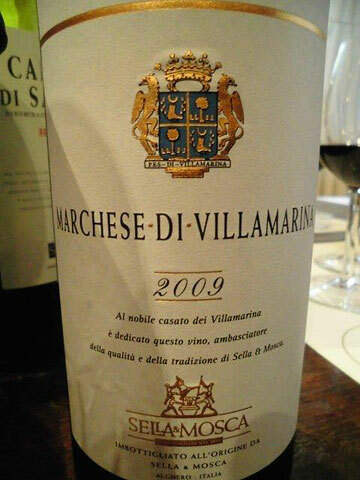 With the cheese, the Marchesi di Villamarina 2009 tasted earlier. Dessert wine: Sella & Mosca Monteluce Alghero Nasco Passito 2011 (my first taste of the Nasco variety unique to Sardinia – old gold colour; high toned nose of pineapple, barley sugar and honey; full-bodied sweet peach flavour (89)). A long drive back to Alghero to check into the Hotel Catalunya. 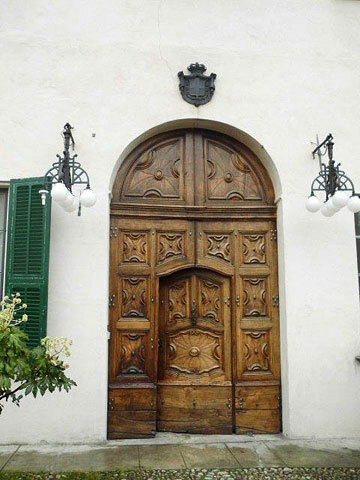 Next stop, Cantina Marchesi Alfieri in San Martino Alfieri. A magnificent Baroque property dating back to 1692, now a luxury hotel and B&B. Marchesi Alfieri La Tota Barbera d’Asti 2012: deep ruby colour; earthy, herbal, leather, cherry nose; richer on the palate than 2011 with a smoky, tarry note. Full on the palate. We ended the tasting Cocchi Americano Aperitivo. A two-hour drive back to Alba to check into the I Castelli Hotel in Alba. While the rest of the group went on to a dinner with winemakers at Ristorante La Crota in Roddi, Rod, Steve and I opted to have a quiet meal and went looking for a pizza place. We found Sole Mio Ristofiziopizzeria and ordered delicious pizzas with a bottle of Barbaresco 2010 specially bottled for the restaurant. Got to bed by 10:30 pm. Thursday, November 27: A great night’s sleep, the first since arriving in Italy. On the way to visit Domenico Clerico in Monteforte Alba, our guide Sandro, a sommelier, pointed out the Ferrero factory where they make Nutella and Ferrero Rocher. He also told us about a new documentary called Barolo Boys – about an association of 15 top producers plus one woman who also sponsor the local Monforte soccer team. Their jerseys are, of course, the colour of Barolo. 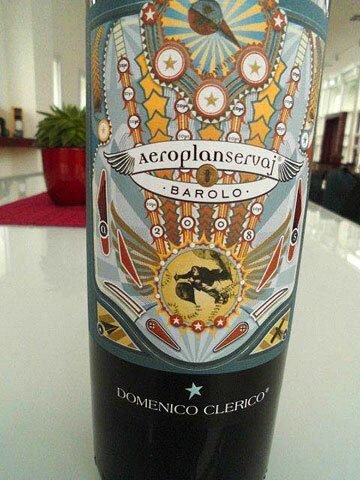 There are 350 Barolo producers, 500 including those who buy the wine and bottle it themselves. Sandro also told us about the history of Barolo. 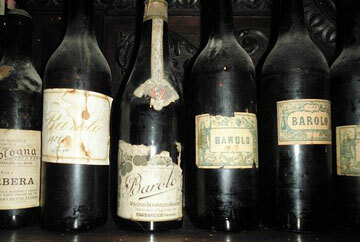 Until the mid-19th century Barolo used to be a slightly sweet and slightly sparkling wine. 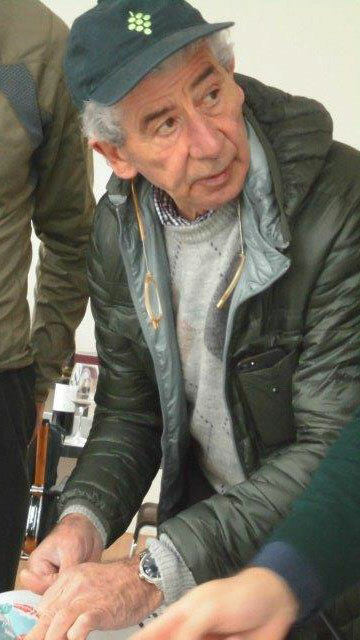 It was Marchese di Barolo, Carlo Tancredi Falletti, who made the first modern Barolo and called it after the name of the village where he lived. And how, in the 1960s, the sons of producers wanted to revolutionize the family business by dropping fruit to concentrate the wine. 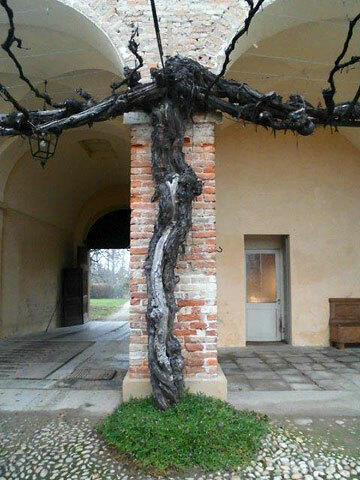 The idea was blasphemous to the older generation and many young winemakers were banished to create their own wineries. Sandro pointed out “the university for truffle hunting dogs” where they are trained to sniff out the tubers. We arrived at Domenico Clerico in Monforte d’Alba. The new winery looks like an airline terminal. 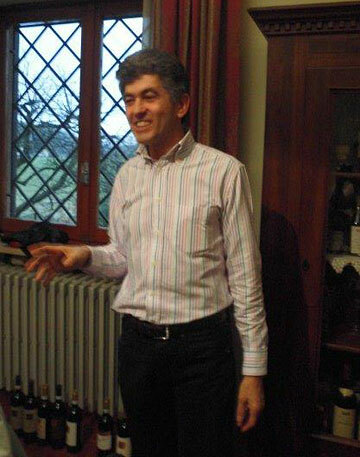 Oscar Arrivabene, the winemaker, conducted the tasting in the presence of his boss. The tasting ended with a glass of Gosset Champagne as a palate cleanser. We drove around the Barolo region and ended up in Verduno for a tasting at Castello di Verduno, today a winery, an hotel and a restaurant called Ca’ del Re. The winemaker, Mario Andrion, led us through the following wines. Castello di Verduno Basadone 2013 (Pelaverga piccolo): light ruby colour; cherry, tar and white pepper nose with a floral note; fruity, raspberry flavour with lively acidity and a tannic lift on the finish. 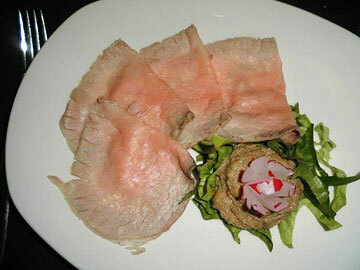 Beaujolais-like (88). Eleven producers of this rare variety; less than 30 hectares planted. We lunched at the Castello’s restaurant, Ca’ del Re. Accompanying the opening dish of veal tartar with slivers of sheep’s cheese we had the white version of Pelaverga – Castello di Verduno Pelaverga 2013 (pale straw colour; a nose of peaches and white flowers with a thread of minerality; green pineapple flavour with lively acidity (88)). Next course, cream cheese discs with olive paste, followed by pumpkin risotto and blue cheese. Then chocolate ganache for dessert with grappa. Visit to the wine museum in the town of Barolo’s Falletti Castle, known locally as WiMu, “an interactive voyage through culture and wine traditions.” Then on to Fratelli Serio & Battista Borgogno on the top of Cannubi hill for another tasting. 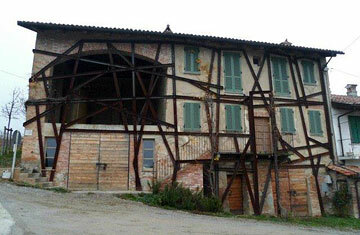 Friday, November 28: Our first stop was Azienda Agricola Rivetto within sight of the Serralunga castle. 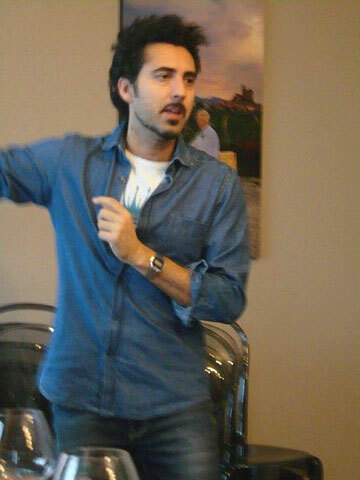 The young 4th generation winemaker, Enrico Rivetto, showed us the sparkling Nebbiolo he’s working on. The grapes were cut a thumb’s length from the tip of the bunches. The wine, spending 42 months on the lees, will be called “Nebbione.” Five other producers in this region and in Gattinara and Val d’Aosta are working on this concept. Enrico also is experimenting with fermentation in a 400 litre terracotta amphora. 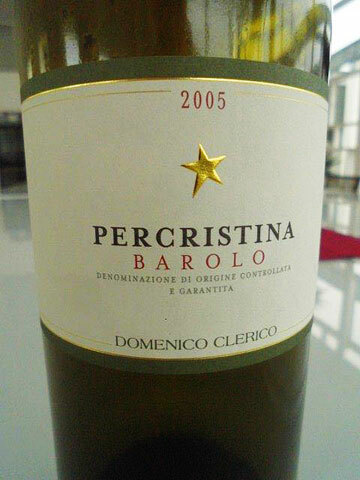 He also makes the rare Nascetta, the only white grape native to the Langhe. 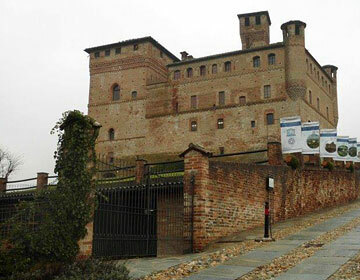 After visiting Rivetto we bussed to Castello di Grinzane (another UNESCO World Heritage Site) where Cavour lived. Then on to an organic winery, Azienda Agricola Ressia in Nieve where we had a lunch tasting (the wines by Fabrizio Ressia and the food, a typical local menu, prepared by his mother). Tonnato vitello, Toma cheese, lettuce and walnut salad, salamis and lardo, Russian salad with tuna and roasted peppers with anchovy and capers. 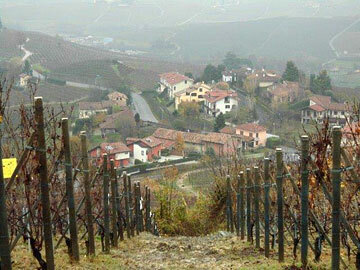 Next stop, Gigi Rosso in Castiglione Falletto, in the centre of the Barolo region. 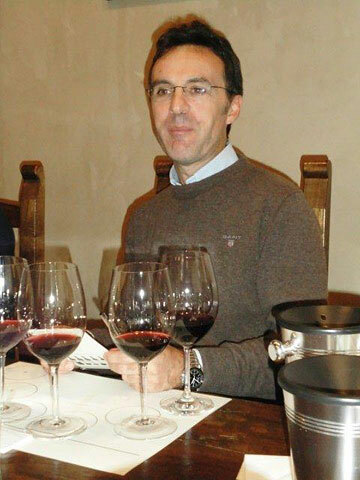 Maurizio Rosso, married to a Californian, conducted the tasting. 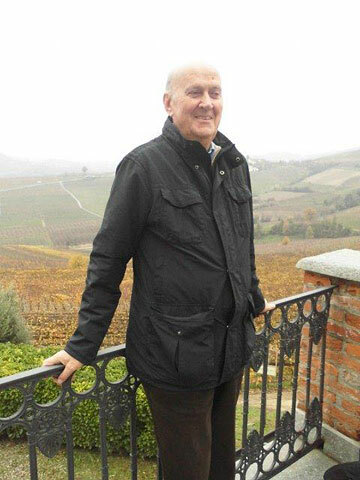 He told us Barolo produces 13 million bottles while Barbaresco produces 3.5 to 4 million. Dinner in Monforte d’Alba at Ristorante Le Case della Saracca. The restaurant is carved into the side of a hill, on several levels, with tiny rooms. When I saw it I realised it was the same restaurant our Pauwels group dined in in May 2012. There were two wine producers there and a guy who headed the truffle association who spoke to our group about the cultural importance of truffles to Piemonte (but there were no truffles served with the meal!). We started off with vitello tonnato (again), followed by a Jerusalem artichoke flan with a sauce of olive oil, cream and anchovy, then ravioli stuffed with spinach and pork in a butter and thyme sauce, then roast veal, French fries, grilled cabbage, eggplant and red peppers. Dessert, chocolate cake. We tasted the wines of Olivero Mario, Poderi Ruggeri Corsini, and a magnum of Domenico Clerico Bricotta Barolo 2009 (a richly extracted, spicy fruitcake of a wine with black cherry, blackcurrant and licorice flavours; firmly structured, elegant with well integrated oak (92)). Got back to the hotel at 12:30 am, packed and slept till the wake-up call at 7 am. Saturday, November 29: Our group was bussed to Torino airport for the flight to Rome. The transit lines at Fiumacino Airport were horrendous so I used my British passport to get through the EU passport line. There were almost fist-fights in the other line as passengers tried to get through the electronic controls. From Rome we flew to Toronto. 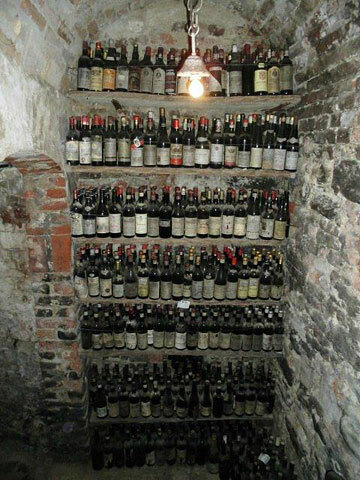 Italian wine – a great post!